The East of England is the most eastery region of England and indeed of the whole United Kingdom. It lies broadly to the north of London, the Thames estuary and South East England, to the south of the Wash (the square shaped indentation in England's east coast) and to the east of the East Midlands. 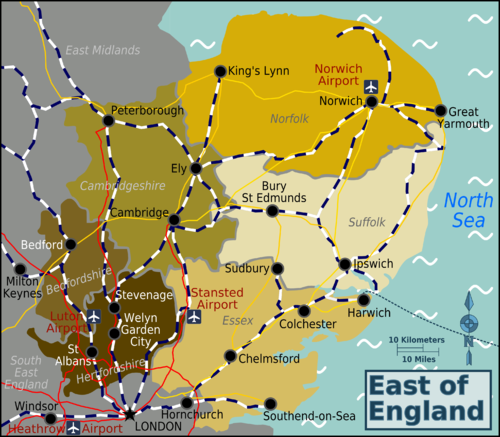 The most easterly parts of this region are known as "East Anglia", which at its strictest definition only includes Norfolk and Suffolk but often includes all or part Cambridgeshire and at its loosest definition covers the entire East of England. The East of England is historically a rural region of small capitals, market towns and picturesque villages. The character of the flattish landscape has been heavily influenced by the people that live on it - most notably with the draining of the Fens transforming marshland into fertile farmland, and the ancient excavations that resulted in the waterways of Norfolk's Broads. Proximity to the capital city and good farming has long made the region relatively prosperous, and much of the southern area of the region now serves as a base for commuters to London. The effect of this London overspill has been the rapid growth of suburban housing in the regions towns and the construction of purpose-built "New Towns" such as Letchworth, Welwyn Garden City, Stevenage. The East of England is an English-speaking region, and travellers should have little difficulty in understanding locals, who generally speak in an accent similar to that of London and most of South Eastern England. The exception to this is Norfolk, in which a strong local dialect persists. The region contains two of the UK's top five busiest airports: London Stansted (in Essex) and Luton airport (in Bedfordshire). There is also Norwich Internationl Airport which mainly serves domestic and European flights but there are also a smattering of departures to the Middle East, North Africa and Chicago. Harwich International Port - scheduled ferries are operated by Stena Line to Rotterdam and Hook of Holland in The Netherlands and by DFDS Tor Line to Esbjerg in Denmark. Some cruise ships also dock in Harwich. The main train lines radiate north from London: the Great Eastern Line links Colchester, Ipswich and Norwich, the major East Coast Line passes through Stevenage and Peterborough en route to Scotland and the Midland Main Line runs through St Albans and Bedford to Yorkshire. There is also a smaller line from London to Cambridge via Stansted Airport. Routes heading west are more limited and pass via Peterborough. The region is well served by rail services in a North/South direction, less so in an East/West direction. Rural bus services operate in most parts of the region, and tend to offer good service. National Express offer infrequent long distance coach services. The regions road network is generally in a good condition and relatively traffic free in most areas, though what appears to be a major trunk route in a map often turns out to be a windy rural road passing through villages. Drivers should be careful on the region's roads, which often have deceptively sharp corners and are flanked by deep, unfenced drainage ditches. This page was last edited on 11 April 2016, at 09:08.